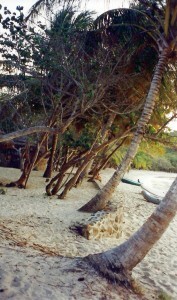 Mayreau is the smallest inhabited island in the Grenadines with just two hundred and fifty residents. It is accessible only by boat. 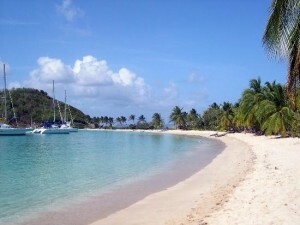 It is located midway between Canouan and Union island. 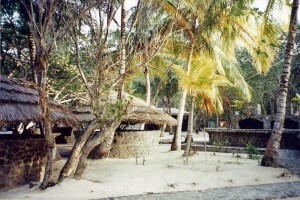 The palm-fringed beaches and sugar-white sand on the island is a welcome sight to sailors. Boats anchored at Salt Whistle Bay. We dropped the sails and motored in the final distance to Salt Whistle Bay. It took us three tries to set the hook. We could clearly see the two to three meters to the ocean floor, and after each attempt we could see the anchor dragging in the sand. It finally grabbed on our third effort. After our recent experience on Union Island, we wanted to make sure we wouldn’t wake up in the pre-dawn hours (when the winds tend to pick up) drifting out to sea. With Patrick at the helm, Karen and I once again dove to the ocean floor to check our anchor. It was a rather showy entrance. 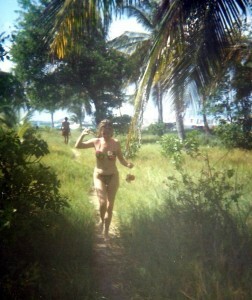 There was a quaint open-air bar on the sandy shores of Mayreau. A group of fellow sailors watched as we fumbled our anchorage and dove multiple times to the ocean bottom. They seemed a little bemused. We finally headed out to the bar and joined them. The group was from Germany. (We met sailors from all over the world on our ten-day voyage.) 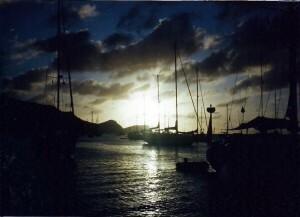 As the sun set we shared our sailing stories. Not everyone spoke English, so with “hands and feet” we regaled one another with our adventures. In the balmy weather swim suits are de rigueur. We swam back to our boat. We didn’t bother to use the dinghy. The water and air temperature were nearly the same, and it was a picture-perfect evening. We prepared dinner in our cabin, and were not surprised when our German friends returned to taxi us over to their boat. They were a hearty Bavarian group who liked to party. Their boat was a 51-foot sloop, skippered by Reiner, and the group of five had been sailing for over three weeks. (Our ten-day sail paled in comparison.) We sat on the deck talking, drinking, and watching the stars. They seemed to hang low in the sky, nearly touching the water. The halyard lines slapped against the mast with a distinctive clanging sound. The ever-present trade wind caressed our skin. Mayreau and the Cays are a sailor’s dream location. Windswept palms on the beach. As the night played out I found myself looking into the bluest eyes I have ever seen, as blue as the Caribbean waters. In such favorable conditions, romance is hard to resist. The stars blinked their approval. In the pre-dawn hours my new friend finally taxied me back to our boat. Anchored boats form a small community of their own.